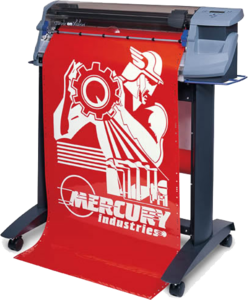 The enVision series 750 (30″ self-standing) sprocket-feed plotters, are designed for the rigors of everyday use while offering the ultimate in speed, reliability, and durability. The enVision series runs on Gerber OMEGA™ software, as well as most popular design software platforms supporting HP-GL. With ultra-precise tracking and simple material loading the Gerber enVision series are the fastest sprocket-feed plotters on the market.